Stretch receptor in tendon –> stretch–> afferent to spinal cord –> synapse directly to efferent –> motor neuron –> contraction of extensor. Afferent and efferent neuron separated by at least one interneuron. Conscious tracts – Comprised of the dorsal column-medial lemniscal pathway, and the anterolateral system. Dorsal column – vibration, proprioception, fine touch. Dorsal column–> medial leminiscus(brain stem). UL travel in fasciculus cuneatus. LL travel in fasciculus gracillis. Decuss in medulla as second order neuron which goes to thalamus(ventral posterolateral nucleus). Third order neuron: Thalamus–> internal capsule–> sensory cortex. Anterolateral spinothalamic tract – crude touch, pressure. Both enter and ascend 1-2levels then terminate in dorsal horn(substantia gelatinosa). Then third neuron–> internal capsule to sensory cortex. Cortex –> internal capsule(between thalamus and basal ganglia)–> crus of cerebri–> midbrain/pons/medulla–> divides into lateral and anterior corticospinal tracts–> terminate in ventral horn at synapse with lower motor neuron. Lateral tract decuss at medulla while anterior spinal tract descends to cervical/thoracic level then decuss. Sensation of various parts of the body occupies different amount of the sensory cortex reflecting the depth of sensory detail in each body part- this is the visual representation. LP – lower quadrant is via Parietal radiation. Upper is Temporal radiation. 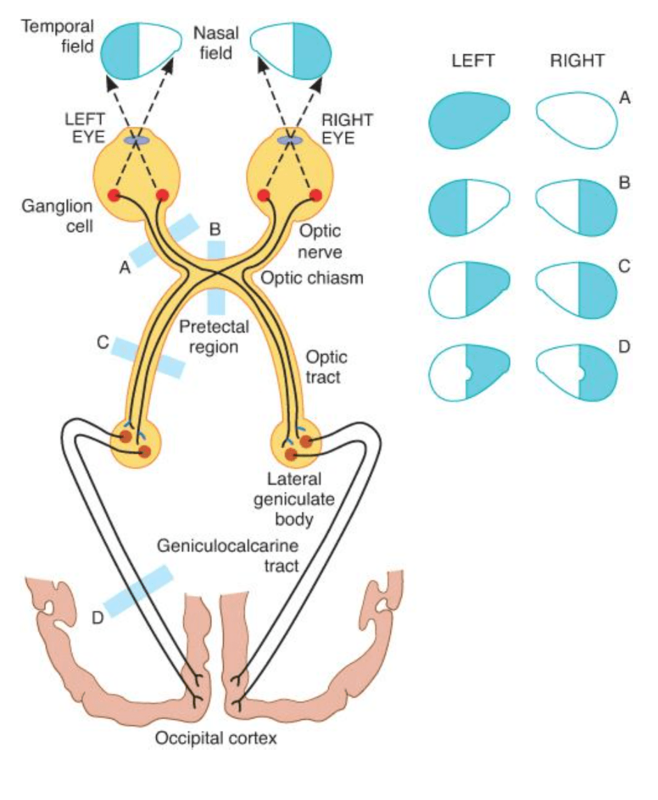 Sensory – CN 2 –> CN3 leads to pupillary constriction in both eyes. Overview of anatomy and auditory pathways. External ear captures sound and funnels it –> tympanic membrane vibrates–> transmitted by the stapes, incus and malleus(who act as step down with help from stapedius and tensor tympani) to oval window of inner ear –> hair cells in cochlea activate at different frequencies –> change sound energy to electrical energy and transmit to brain via CN 8.